Authors’ note: This is deep water stuff. Mimir’s Well stuff. We have done our best to make it understandable to people who may not have had certain experiences, but odds are some words have come to mean different things to us. One example: For almost everyone, “smart” implies your ability to retain and apply information. For us, “smart” means your ability to recognize the situation and adapt to it. And that usually involves rejecting irrelevant information. In the normal world, a “smart” fighter will know a thousand techniques and the nuances of self-defense law. In our world a “smart” fighter forgets all but the handful of techniques he or she needs in the moment and understands that under SD law your options are either none, graded, or unfettered, and knows where those thresholds are. In the common world, a smart fighter is expected to be cognitively engaged. In our world a smart fighter is expected to reject that. Sort of. We’ve all heard variants of this theme. To a professional, it doesn’t make a lot of sense. Aggression is an emotion, and emotional fighters make mistakes. 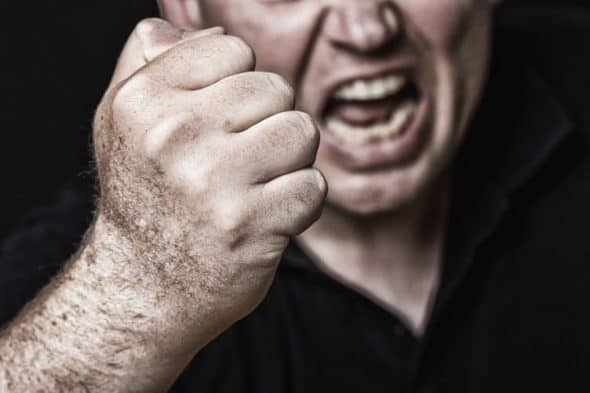 Aggressive people get into unnecessary conflicts. They walk into set-ups. When they do fight and prevail, they often continue– aggressive fighters can easily turn a legitimate use of force into assault. Within a very limited scope, aggression makes sense. For novices at violence one of the big problems, maybe the biggest, is getting them to act at all. Despite years of training, in the first encounter, the hindbrain knows that training is unreal, and wants to use tactics that have evolved over millennia, like freezing. Also, the trained knowledge that one must act with force runs head-on into the social conditioning that ‘force is wrong’ and one ‘should be polite.’ In the brain, conditioning trumps training. Encouraging and tapping into emotion is one way to bridge this gap. People will do things for “feelz” that they won’t do under objective need. Here’s a potential language problem, because what professionals use can look an awful lot like aggression and is frequently even called aggression, but it is a different thing. It is decisiveness. Decisiveness encompasses explosive motion, violence of action, speed of perception, processing and execution, all working towards a goal. The difference between decisiveness and aggression is that decisiveness is aimed at an objective, professional goal: to escape or to disable or to handcuff or to… Aggression is aimed at an internal goal. An emotional goal. Usually to assuage fear. As a rule, novices use force because they are afraid, they use as much force as their fear dictates and they continue to use force until the fear dissipates. In a word, aggression makes you stupid, not decisive. And this goes into language again, because being stupid is generally safer and more effective than being passive. And if you equate stupid with uncivilized, well, most civilized people don’t fight very well. People (talking students here) tend to be very out-of-touch with the emotional intensity of physical conflict. Because of that, most people misread their own emotional intensity. For example, the person who was insulted and felt such a huge rage that years later he talks about the darkness within him, and never grasped that he didn’t actually do a damn thing. Or the common advice that if you want a student to be assertive, you usually have to instruct that student to be aggressive. On that level, “Be aggressive” might be excellent advice. When you are aggressive, you will use the highest force option available* to you and you will use it a lot. As a rule you will also use it inefficiently. When you are using an emotion as the basis and motivator for your action, it becomes entirely too easy to go overboard, perceive things as dangerous that aren’t, and not know when it is time to stop. A force professional must be in control during every step—the initiation of action, the scale of force used and when the forces ceases. Often, when to stop is the hardest call, especially when emotions take over. Violence is a tool to achieve an end, whether keeping peace in a jail, safeguarding people, or throwing drunks out, it is a tool to do a job. When you are based in emotion, that stopping point is not as obvious. Our experience is that lower levels of force applied decisively are more effective than higher levels of force applied emotionally. Aggression is a very easy trip to the land of excessive force and decisiveness is not. When you decide, you are in control, when you react with emotion, you are riding a train that is not driven by your rational mind. Essentially, decisiveness may not be accessible to novices and so there is some utility in emphasizing aggressiveness and rage. However, it is only a doorway to reach the ability to be decisive. Decisiveness gives you all of the benefits of aggression without the pitfalls. *Available both physically and emotionally. When an armed officer goes into a feeding frenzy with a baton, his firearm was available physically, but not emotionally.